Set in 2 acres of enclosed garden and croft, amidst stunning scenery in Europe's last great wilderness, our 2 Cottages make ideal bases for relaxing, walking, sailing, fishing (sea and loch), beach combing and geology; all from your doorstep! Each cottage, beautifully renovated, retains individual historic character and charm. Within a drive of only two hours from Inverness, we offer total peace and tranquillity. We offer the following self-catering accommodation (please click on each for further information) The Smithy, The Byre and Roadside Cottage located 2 miles away by the sea. nicely renovated with wood burner. bright light and wood burner. 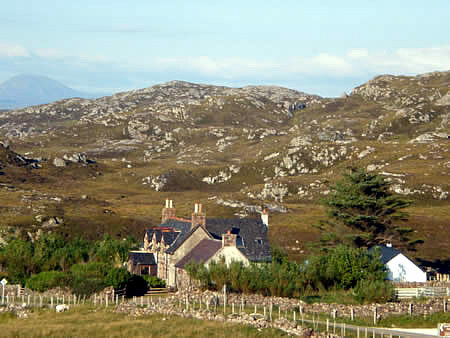 Renovated Highland crofters cottages, sleeps 1 to 4, two bedrooms: 1 double, 1 twin, bright light open chimney. A quiet location in a beautiful unspoilt environment surrounded by hills, coast, beaches and wildlife. All 3 cottages are comfortable, warm and have facilties to make your stay pleasant and relaxing. The location is quiet and pleasant and we ensure you get the privacy you desire but are on hand to help if required. A great little crofting community that is close enough to places to make it accessible but far enough to escape. We have shops and businesses near by as well as some great sights and places to visit and explore. The Highlands really are a very special and unique part of the world, vast unspoilt moors, hills, mountains and valleys, remote beaches and coast, deer, eagles, pine martin and wildlife literally on the doorstep of the cottages.